Formerly known as Dumfries and Galloway Environmental Resources Centre (DGERC), the South West Scotland Environmental Information Centre (SWSEIC) is the local environmental records centre covering Dumfries & Galloway and Ayrshire. The Centre aims to further the appreciation, understanding and protection of the natural environment of SW Scotland by collating, managing and safeguarding information about the natural environment. 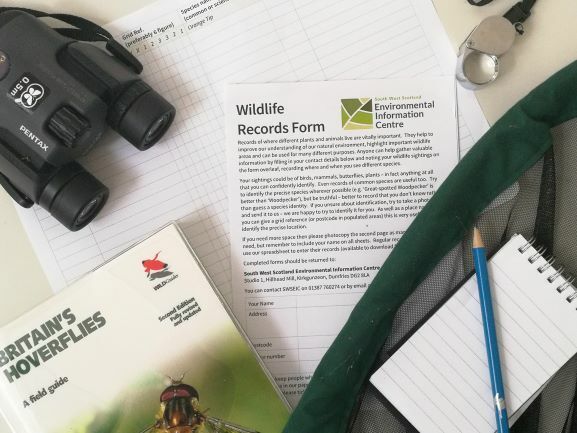 The Centre manages a database of wildlife and habitat records for the region and provides a focal point through which anyone may access this information. It is hosted by the Southern Uplands Partnership. Amphibian and reptile data for Dumfries and Galloway. Amphibian and reptile records held in custodianship by DGERC. A collection of contemporary and historical records of micro-moths in Dumfries and Galloway. Odonata records for Dumfries and Galloway. Records of Odonata held in custodianship by DGERC.